I love end-of-the-season sales. Have you ever noticed how things you’ve never seen before suddenly appear in the end-of-season sales? I found this magnificent sweater at such a Nordstrom end-of-season sale a few years ago and I remember thinking, Where did you come from, you extraordinary thing? The color of this sweater is hard to describe. Is it green? Not exactly. Is it blue? Well, there’s yellow in it. Teal? Turquoise? Emerald? 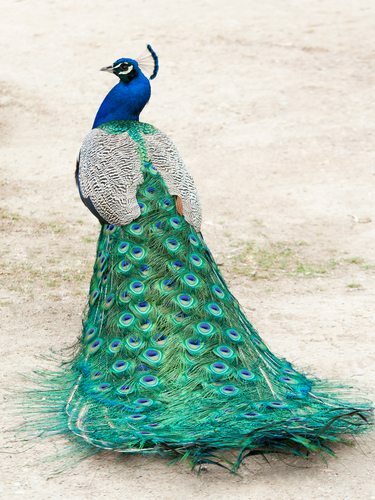 It’s the color of a peacock. Not peacock blue. 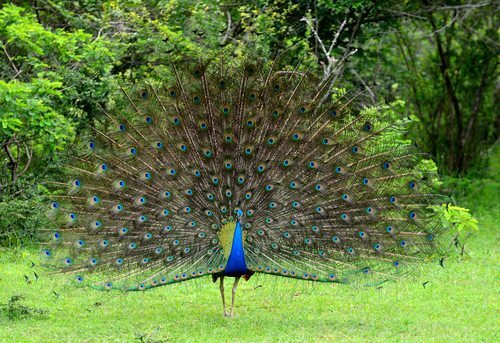 The whole peacock. It’s the coloring of a peacock. Perhaps it would help if the peacock folded up his tail and moved away from the shrubs? Or we could compare, side-by-side. Who Wore It Better? 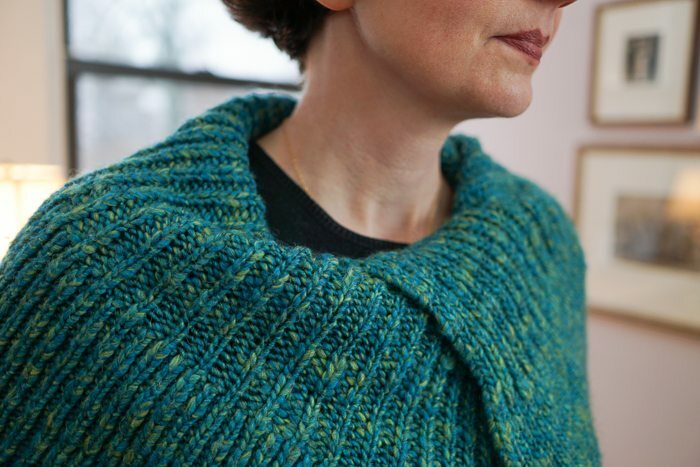 Come a little closer and see how many colors (plies) are working together in this this knit. 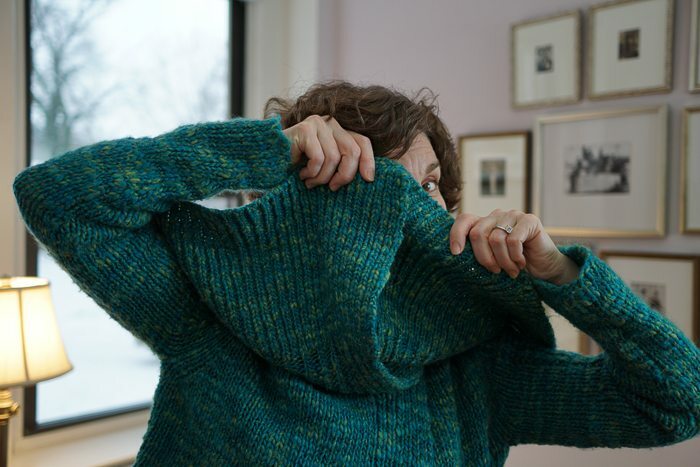 To state the obvious, this sweater is cropped and features an enormous portrait collar. The collar is almost as large as the body of the sweater. The ultimate effect is one of a shrug or wrap. Clearly I cannot resist playing with this giant, cozy collar. I like this sweater best with wide-legged pants (as seen above), but thought I would also show it with skinnier pants. It works with both types of proportions. And now for the lesson! 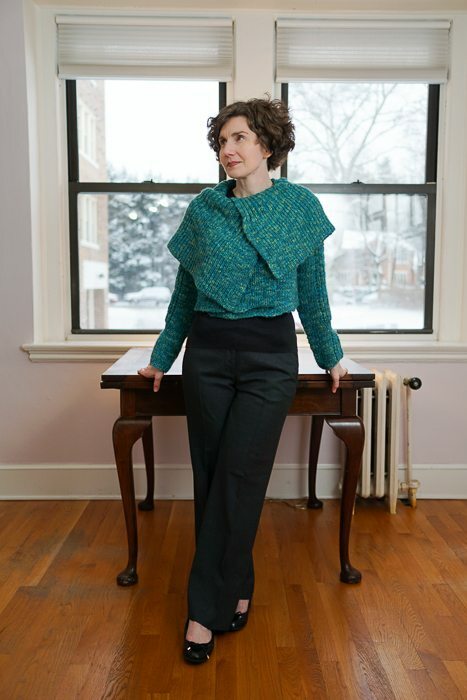 The formula for this outfit is one I’ve shared before and it is no-fail: a blouse/jersey/sweater and matching pants worn under a jacket/sweater of another color (preferably a distinctive or bright color). 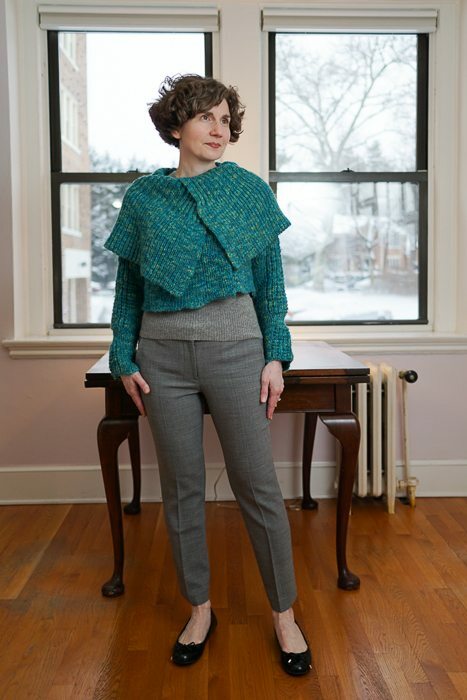 The alternative formula is: a sweater/jacket worn over a blouse/sweater of the same color (or a shade thereof) with a pair of grey, black, or taupe pants. The sweater colour is gorgeous! It looks so good over both black and grey pants. I was wondering though, how does it work under a coat. Do you need a looser fit topper over it? I do, Diane! 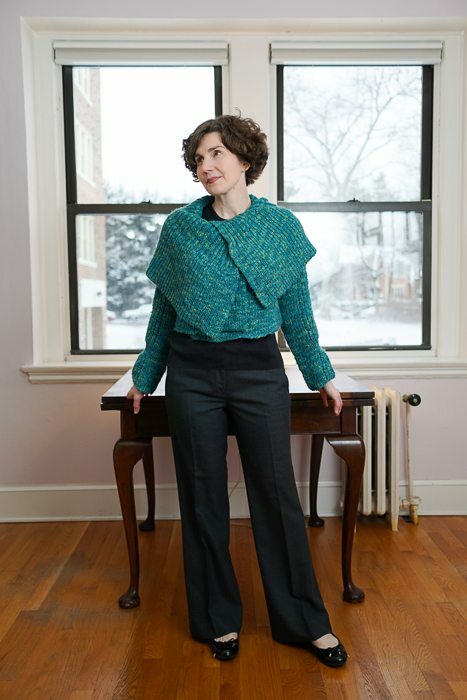 I have one winter coat that is a size larger than I normally wear and cut very loose; it’s roomy enough to wear over a suit, a bulky sweater, and even a wool wrap. When I bought it, I hadn’t figured out how useful it could be; I just wanted a roomy coat and bought it even though it was probably too big. I have a fitted coat to wear with dresses and regular sweaters. The sweater is admirable and you wear it well. The skinny cropped pants are A-MAZING! Love those! Encore! Sharla — You are too kind! Thank you for visiting! As I scrolled down the page, I was wondering how the sweater might look with gray. And there is was! So clever of our Directrice to provide several support acts. And, I do believe I prefer gray. guffaw – the balaclava for a crime spree!